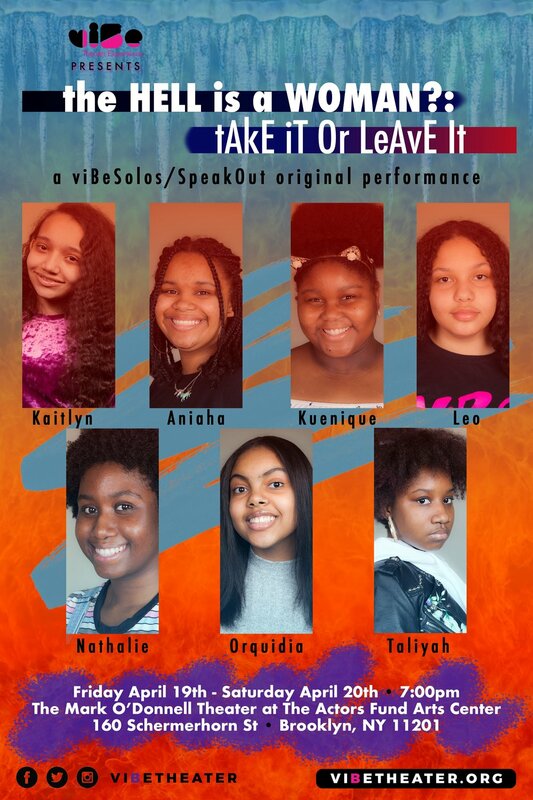 Join us Friday, April 19th and Saturday April 20th at 7:00 p.m. for a brand new viBeSolos/SpeakOut show written and performed by Aniaha, Orquedia, Kuenique, Nathalie, Taliyah, Leo, and Kaitlyn! an original performance exploring perceptions and misconceptions about girlhood, sisterhood, and the journey to realizing your dreams. Join viBe’s Board of Directors for a special Happy Hour fundraiser for viBe on Thursday, November 8th 2018! Tunes by DJ Tara with our thanks to Ode to Babel for donating part of the proceeds from the evening to viBe Theater Experience. Can't attend? We’ll miss you, but please consider making a donation to support our growing organization! We accomplished more than ever before in FY18, and have plans to do even more in 2019! Check out “What is Unseen Must Be Heard” viBe Leadership Institute’s brand new original play, on August 9th at A.R.T. NY South Oxford Space (The Great Room). viBe Leadership Institute is a training program for young women, created to helping them develop the skills necessary to lead arts programs, and become arts practitioners in the field. Participants attend training workshops, a retreat, and receive ongoing, one-on-one support from viBe trainers and staff. Thus far, in viBe Leadership Institute we have been exploring and interrogating our understanding of "power" "leadership" and naming the specific messages that our young women want to share with their communities, and their audience. Join us for viBe's **2017 Winter Show** Featuring **TWO** original shows in ONE night! Come celebrate the release of the debut album by 2017 SongMakers, Femme Fatale! Femme Fatale is Jennah, Sinaih, Starr, Tatyanni, Anais and Kayla with a backing band featuring Ava Mendoza on guitar, Gabriela Baez on bass, Briana Barber on piano and Savannah Harris on drums. Vocal and songwriting coaching by Fay Victor. Join us as we celebrate viBe's partnership with Groundswell Community Mural Project, and the completion of a mural created by viBe girls that will serve as a permanent set piece for viBe productions! The Truth About Our World is a new show written and performed by the ladies of viBeSolos 2017. The show explores a range of societal challenges that black girls currently face, including beauty standards (and the struggle to find "beauty products" for darker skin), domestic abuse, LGBTQ identities, and the fear of living under the regime of the current administration. The show is a fearless exploration of life for black girls, and seeks to help us all see the truth about our world. Irondale Theater's Young Company will open the show! Tickets $10 http://vibesolos2017.bpt.me/ VIP Reception after the show! viBe provides underserved girls (ages 13-19) with free artistic, leadership and academic opportunities. We arm participants with tools to communicate their ideas in performance and equip them with academic and life skills in an accepting creative space. Our curriculum challenges girls with challenging, fulfilling opportunities in writing, producing and performing their own plays. 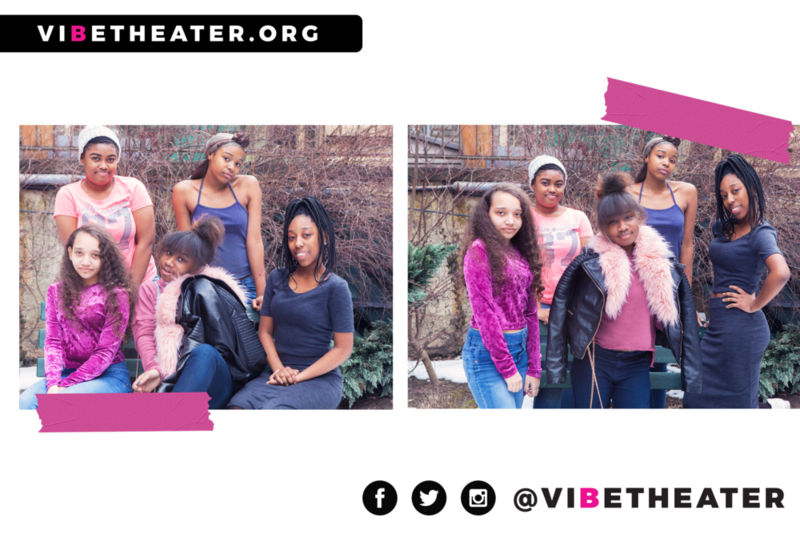 Each Summer, Fall, and Spring, an ensemble of diverse teenage girls write and perform one narrative-based play with songs and dances performed in professional theater venues in Manhattan. Our professional teaching artists inspire girls to create stories, monologues, scenes, dances and songs about their collective and individual passion, struggles, hopes and dreams. SongMakers latest new group Wave 16 is Rebecca Fraser, Kyana Manning, Moniece Thompson and Kiana Edwards! On May 21, they were in the studio with a dynamic new band featuring Briana Barber on piano, Jeff Tobias on bass and sax, Jessie Nelson on drums and Amirtha Kidambi on backing vocals. They recorded their album at the fantastic pro-studio Figure 8 in Prospect Heights! Come out, hear them perform their songs and pick up the newest viBeSongmakers album at the record release party on Sunday, June 12th at JACK! In addition to Wave 16, we'll be featuring performances by viBe Alumnae Twisted Talent, Aissatu Young and Jaynan Evelyn! viBe is thrilled to be performing at the 23rd Annual Red Hook Fest on Saturday, June 11, as part of cultural activities and performances that will be taking place all day at the Louis J. Valentino, Jr. Park & Pier in Brooklyn from 12-7. To learn more about Red Hook Fest, visit http://dtetc.org/red-hook-fest. We hope you can come out and see us! Poetic Theater Productions’ 4th Annual Generation Now! event features youth created poetic theater. This year’s Generation Now will feature viBe Theater Experience, Girl Be Heard, EarSay Youth Voices, Urban Word NYC and joining us from East Palo Alto, California, Warrior Writers.